Michelin Soles collaboration with Ecco and the strong partnership with Etnies and Mammut. ECCO EXOSTRIKE equipped with Soles by Michelin, it’s a new revolution! For more than a century Michelin has guaranteed the reliability, safety and performance of tyres for all types of vehicles. 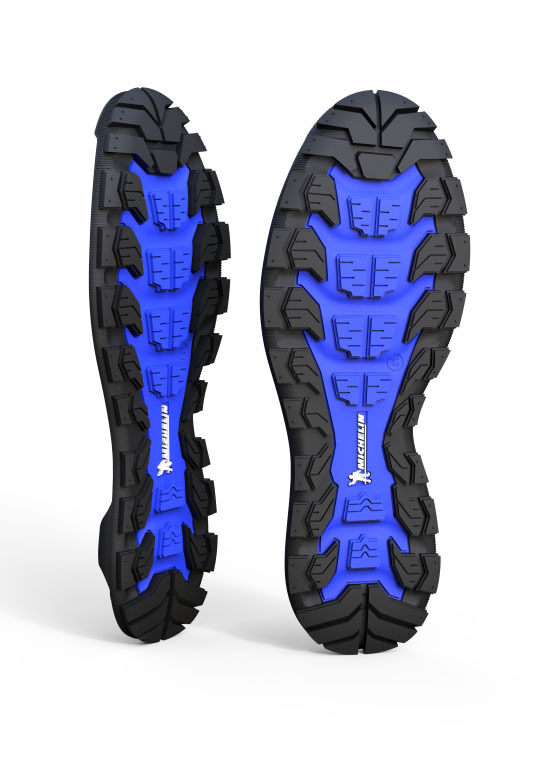 So it’s no surprise that today Michelin Soles applied Michelin know-how and expertise in rubber, traction and durability to a range of soles for high performance shoes. It is exactly because of this knowledge and experience that ECCO has decided to add a sole developed by Michelin on EXOSTRIKE bringing this revolutionary shoe to a next level. 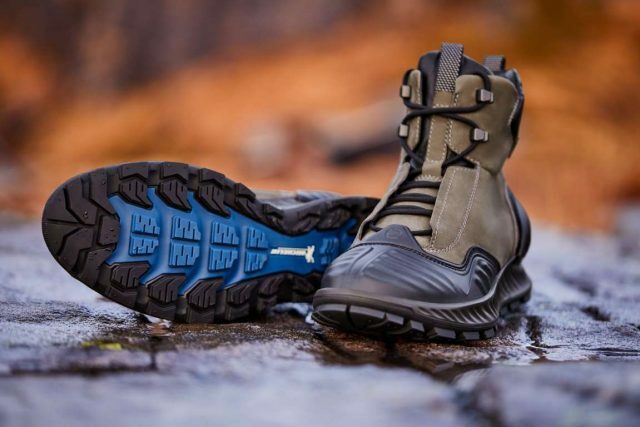 “Wear resistant, flexibility, adherence & adaptability;these are the main qualities our Product Specialist was asked to achieve” said Trond Sonnergren, Head of Innovation at JVI for MICHELIN Soles. – we used a winter compound and took inspiration from the tread of MICHELIN X-Ice. To add stability and wear resistance, our designers developed a base reinforcement (1), siped sculptures for better adherence and adaptability (2) and shoulder sculptures to enrich the soles with an additional great lateral control (3). The flexibility is the result of heel-to-toe grooves (4). Last but not least to improve the wear resistance, we have realized massive sculptures on the heel area (5)”. For more than fifty years, ECCO has been the leader in creating footwear that is uncompromising in its foot first design approach utilizing FLUIDFORM injection technology to deliver anatomically designed midsoles that follow the natural curves of the human foot. With an uncompromising focus on innovation, quality and functionality, it is no surprise that ECCO and Michelin have come together to craft the next level of the EXOSTRIKE boot that delivers a ground breaking aesthetic coupled with the best in class ingredients. 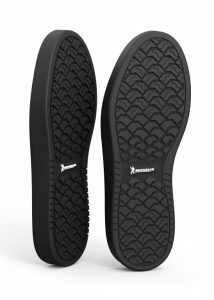 MICHELIN SOLES FOR ETNIES: NEW OUTSOLE FOR A WINTER WITH NO LIMITS! In 2017, Etnies and Michelin drove technological innovation in skateboard shoes by creating the toughest and durable skateboard outsoles in history: the Marana OG. 2019, Outdoor Retailer Snow Show, Michelin and Etnies present a new winter sole for the new FW19 style: Crestone. Crestone is equipped with a new customized winter sole innovation with perfect adherence on ice and enhanced traction on packed snow that also maintains its flexibility at low temperatures. The sole presents (1) siped and multidirectional sculpture for adherence in different directions, (2) bridge reinforcement for support and (3) interlocked tread design for progressive contact surface. We can summarize the benefits in three word: durability, adherence and flexibility. “We are proud to evolve our partnership with Etnies at the OR with an innovative and challenging product to reinforce our partnership. 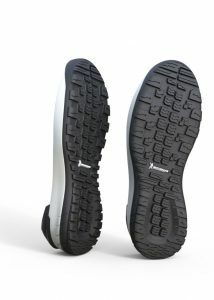 It is through Michelin know-how in ground control and such great collaborations with partners like Etnies we can lead customized soles with innovative and appealing design, ensuring top-of-the-range performances.” – says Filippo Sartor, Partnership Development Manager at JVI for MICHELIN Soles. 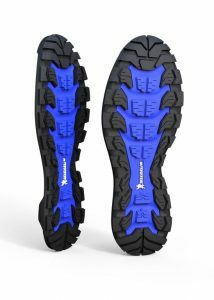 “Partnering with Michelin has allowed us to continue to innovate and push the limits of what’s possible within our footwear product line. Etnies has a long-standing legacy of bringing technical products to market, fulfilling the demanding performance needs of our consumers. Michelin’s advanced rubber technologies, understanding of our design needs, and ability to meet our high performance standards creates a perfect partnership that allows us to extend that legacy. And we are excited to see this partnership evolve and develop into emerging consumer spaces.” Comments Charlie Manos – Sr. Director of Footwear, Sole Technology. Michelin’s expertise in ground control is at the base of the new FW19/20 boot by Mammut: Falera High WP Women. An urbaneering female boot with an unique design and equipped with soles developed by Michelin where traction, stability and adherence are the key benefits. Elements come from the ‘ground contact’ expertise; a concept Michelin has been working on for over a century, and on several fronts: from automotive to agriculture, from aeronautic tyres to two-wheel motor and pedal vehicles; a concept we find daily in Michelin Soles developing life. Adherence and adaptability are achieved by siped sculptures and micro-pumps, which absorb and evacuate water improving adherence. The traction is achieved by a progressive tread design, which offers an increasing heel-to-toe traction, and “last but not least” the massive sculpture on the heel area improves the durability of the sole. Faleras’ sole takes inspiration from the Michelin NA00 tyre tread, which combined with the expertise of our designer, a special winter compound and a soft anti slip rubber, brings Falera to be the boot to wear next winter, achieving high performance in cold temperatures. “Product innovation has enormous importance for Mammut. Accordingly, we are very happy to have Michelin as a partner with a leading role in soles. The Falera is the fifth jointly designed shoe, which optimally covers the needs of Mammut customers,” says Marc Estor, Head of Business Unit Footwear at Mammut Sports Group AG.